Today, buyers are more cautious and skeptical about the products and services they buy. They need more proof and more validation than ever before, and customer success stories and case studies give them the credibility, education and validation they need. 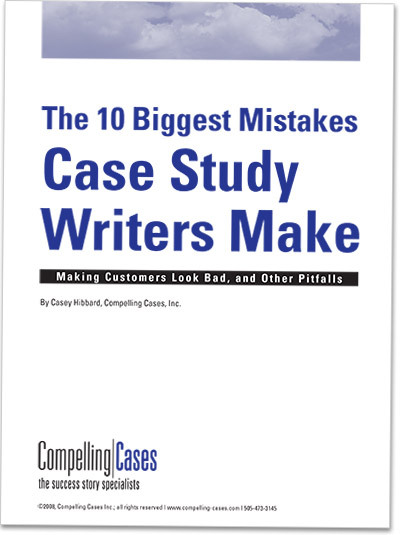 Learn how to produce case studies and success stories that produce results in the report, The 10 Biggest Mistakes Case Study Writers Make. Whether you write as an employee for your organization or work as a freelancer, your “client” looks to you to translate their successes into stories that resonate with readers and drive them to buy. The one step in case study preparation you should NEVER skip. The fastest way to annoy featured customers in interviews. Why you should have interview questions written out before every interview. How to get better results metrics out of featured customers. How to find each story’s best angle. Ways to avoid making featured customers look bad! Tips for catering to readers who only “skim” customer stories. Finding the balance between a dull story and one that’s too enthusiastic!